Chateau Le Boscq enjoys a long history in the Saint Estephe appellation as it dates all the way back to early in the 18th century. At the time of its creation, the chateau was built for Thomas Barton, better known today for owning Chateau Leoville Barton and Chateau Langoa Barton in St. Julien. However, the rebirth of the estate took place in 1995, when it was purchased by the Dourthe group, which also owns the massive negociant company, CVGB as well as other estates in the Medoc and St. Emilion. Once the new owners took over, the entire estate was renovated. The old wood fermentation vats were removed and replaced by modern, stainless tanks. The 18 hectare Left Bank vineyard of Chateau Le Boscq is planted to a cepage of 56% Merlot, 35% Cabernet Sauvignon, 7% Petit Verdot and 2% Cabernet Franc. The vineyard is situated in the cooler terroirs found in the northern end of the St. Estephe appellation. The vines are on average 30 years of age. However, the property has some old vines which are more than 50 years of age. The vineyard is in one large block of vines. The vineyard is planted to a vine density of 8,888 vines per hectare. The terroir is gravel and clay soils. To produce the wine of Chateau Le Boscq, the grapes are vinified in temperature controlled, stainless vats that range in size from 64 hectoliters up to 120 hectoliters. The range vat in sizes allow for more precise vinification on a parcel by parcel basis. Malolactic fermentation takes place in tank. The wine of Chateau Le Boscq is aged in 20% new, French oak barrels for about 12 months. There is a second wine, Heritage de le Bosque. 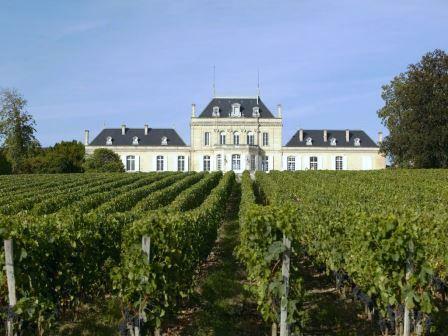 The annual production of Chateau Le Boscq is about 11,000 cases per vintage. The best vintages of Chateau Le Boscq are: 2018, 2017, 2016, 2015, 2014, 2010, 2009 and 2005. Chateau Le Boscq can be enjoyed early. However, the wine is often better with at least a few years of bottle age. Of course that can vary slightly, depending on the vintage. Chateau Le Boscq is usually best enjoyed in the first 8-15 years of life. Young vintages can be decanted for 1 hour or so. This allows the wine to soften and open its perfume. Older vintages might need very little decanting, just enough to remove the sediment. Chateau Le Boscq is best served at 15.5 degrees Celsius, 60 degrees Fahrenheit. The cool temperature gives the wine more freshness and lift. Chateau Le Boscq is best served with all types of classic meat dishes, veal, pork, beef, lamb and roast chicken. Depending on the vintage, Le Boscq is at its best with 5 to 8 years of bottle age, but of course, that varies, with the character of the vintage. Ethereal maroon in hue, the wine is resonant with fleshy, vibrant fruit. The tannins are soft and only a few years are needed to bring out even more complexity. The color of that burgundy lipstick from 1986, this wine isn’t shy about showing off its soft, forward, ripe, sweet, dark red fruits, swanky textures and open style. This is the one your mother warned you about. You can drink her shortly after release and she will age well. Oenophile’s choice. Medium bodied, forward, direct, easy drinking with a black cherry, spice and oaky personality. Medium bodied, tannic, with good freshness, smoke, tobacco, crisp blackberry and earth, this blend of 51% Merlot, 46% Cabernet Sauvignon and 3% Petit Verdot will definitely be better, and hopefully soften with 2-5 years of bottle age. One of the better value wines from St. Estephe, from a blend of 60% Merlot, 30% Cabernet Sauvignon, and 10% Petit Verdot, the wine is medium bodied with notes of coffee bean, dark cherries, stone and earth. Round in texture, there is a nice black raspberry sensation in the finish. Easy drinking, medium bodied, bright red fruit, earth, spice and tobacco stuffed wine that is ready for consumption. A nice value Bordeaux wine here, with lots of spicy cassis, earth and blackberries. This medium bodied wine is ready to drink now and over the next few years. Austere, firm, crunchy, cassis and cranberry notes with a spicy, earthy, tobacco and crisp red berry finish.